Yes, that's right, Jim has decided, for the most part, to take down his Sunday shingle here at Stripper's Guide. I know you will all join me in thanking Jim for his delightful weekly cartoons, which have been running here since March 25, 2007. I never tire of Jim's reminiscences, his life lessons, his games and wordplay, and of course most of all his brilliantly simple cartoons. I will greatly miss his weekly appearances here, and I'm sure you readers will miss them too.I also appreciate, in terms that I cannot even put into words, what a great friend I have in Jim. In addition to all his other kindnesses over the years, these weekly cartoons that brighten up the Stripper's Guide website on Sunday have been a gift to me, and you, of stupendous proportion. If you worry that at 89 years of age Jim is hanging it up for health reasons, put that out of your mind. Jim is, as he would put it himself, in fine fettle. He's definitely on his intended track of making it to at least the 99 year mark. 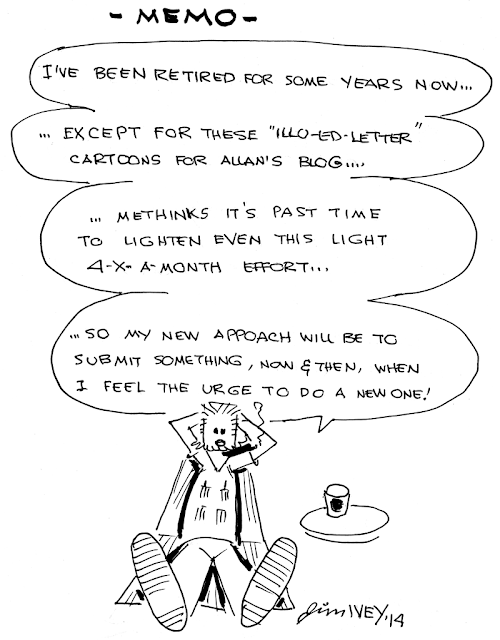 Congratulations, then, Jim, for finally earning a well-deserved retirement after your 70 year cartooning career! Jim has promised that Sunday Comics may continue to be created on an irregular basis, whenever the spirit moves him. We look forward to his occasional visits. I will miss Jim's weekly strips... but it will just make the new ones when we get them all the sweeter! Thanks for the comics Jim! They've been a highlight of my weekends for quite a while now.